Previous years I always longed to visit many places in Kuching whenever we were in town but since we didn't have our own car, I wasn't able to do so. But now that we have our own car here, it is payback time. There's so many things to do and see in Kuching, and one of it is to visit the orang utans in their almost natural environment, Semenggoh Wildlife Rehabilitation Centre. This nature reserve centre has been a rehabilitation centre for orang utans especially the orphaned young, those confiscated from illegal poachers or injured due to deforestation activities with the aim to reintroduce them back to the wild. I'm extremely impressed especially after visiting the gallery and reading about the systematic and massive efforts to help the orang utans. Do you know that the orang utans even have birth certificates just like a human infant? The only difference is their birth cert didn't have details of the father! LOL! Another interesting discovery is they have several stages of 'education system' starting from nursery school, to primary school, to secondary school before they are released to the wild. Our main goal of visiting this centre was to have some experience of being up close and personal with the orang utans during the feeding time (which was at 3pm in the afternoon). Entrance fee is RM5 for Malaysian adult (free admission for children below 12). When we reached the waiting area around 15mins before the feeding time, there were already a crowd of foreign tourists waiting patiently at the designated shed. We decided to kill the time by visiting the crocodile enclosure area nearby. Khayla was terrified at first but soon got over her fear when she saw the reptiles were hardly moving - in fact we thought they were mummified because there wasn't any sign of movement. Even their open eyes were unblinking! 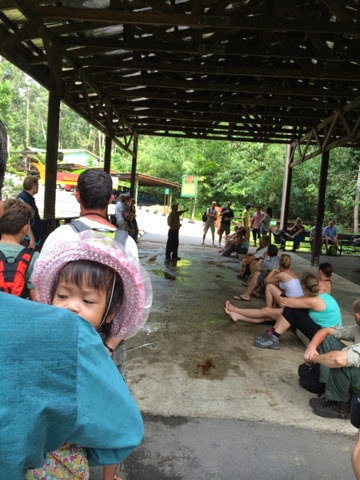 Before the feeding time, a guide gave a short briefing about the orang utan habits and some precautions like keeping our voices down, not bringing any food, and keeping safe distance from the orang utans. That was when I changed my mind about getting in close proximity with the orang utans - what if one of the maternal ones grabbed Khadeeja from my arms and ran up the durian tree with my baby? Then she grows up like Jane the Tarzan girl (for one, she already behaves like one of the baby orang utans, always climbing here and there, grabbing things and have no table manner whatsoever!). Ok, my imagination tended to run wild. Still we joined the throng of visitors climbing up the jungle trail to the main feeding platform, me holding Khayla by the hand and encouraging her to walk steadily up the hilly path. Khadeeja was safely in hubby's arms. If ever one orang utans took a fancy on my baby, she would have to go through my hubby, LOL! Luckily (or unluckily) no orang utan turned up and my worry dissipated. Throughout the time, we heard the rangers giving loud, long cries calling for the orang utans, signaling to them it was feeding time. It is fruits season, explained the guide, so the orang utans are able to feed themselves instead of relying on hand outs. It is a good sign for the wildlife centre because it means the orang utans are self-reliant, but not a good news to the eager and expectant visitors who came all the way from Europe or US to meet them! However we did manage to sight an orang utan high above a durian tree at another location (deeper in the forest, and the climb was much steeper, it was incredible that I managed to climb there carrying Khadeeja in my arms). After that we decided to go back because it looked like it was about to rain. For those who love the nature, do drop by this place. The nature is well-preserved, so if you can't sight the orang utans, you can also go for walks at the various nature trails and at arboretum within this centre. Just Google Semenggoh Wildlife Rehabilitation Centre for more details. My advice, if you really hope to snap that photo of you arms in arms with orang utan, come during the non-fruits season. Or go to Matang Wildlife Centre (but I'm not sure if you can feed them there because they are placed in enclosure).